Law and order has broken down in Baghdad after US troops rolled into the heart of the Iraqi capital and seized control. There have been serious incidents of looting across the city with two key Baghdad hospitals and many smaller ones being ransacked, International Red Cross officials said. Shortly after darkness fell at least four US marines were injured in an apparent suicide bomb attack on a military checkpoint in the area of Saddam City, a poor area in the north of Baghdad. 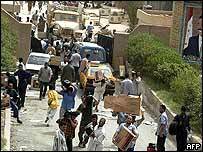 Despite appearing to control large parts of the capital, US troops were engaged in fierce fighting throughout the day, with one US soldier being killed, as they battled pockets of resistance from die-hard supporters of President Saddam Hussein. United Nations and international aid officials have criticised US and British troops for failing to curb the looting in Baghdad and in southern Iraq, saying it threatened to deepen the country's humanitarian crisis. But the Pentagon said US troops were dealing with pockets of resistance as a top priority, before turning their attention to restoring law and order. The BBC's Rageh Omaar in Baghdad says many Iraqis are barricading themselves in their homes for fear of looters and essential services have been crippled. Looters sacked the German embassy and a French cultural centre in the capital, taking furniture, fridges and electrical equipment. The luxurious homes of senior members of Saddam Hussein's regime, including those of his son Uday and Deputy Prime Minister Tariq Aziz were also targeted. 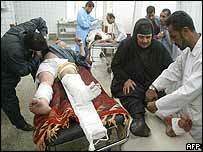 US Lieutenant Colonel Brian MacCoy said he was not bothered by the looting of ministries or homes of Iraqi leaders. "What we must protect is the civilian infrastructure, such as hospitals, power stations and water plants," he said. But when the al-Kindi hospital, one of Baghdad's key medical facilities, was attacked by armed looters, US troops failed to intervene, saying they had no orders to do so. "The coalition forces seem to be completely unable to restrain looters or impose any sort of control on the mobs that now govern the streets," said Veronique Taveau, spokeswoman for the UN Office of the Humanitarian Co-ordinator for Iraq (UNOHCI). "This inaction by the occupying powers is in violation of the Geneva Conventions." US troops came under fire in several parts of the city on Thursday. At one checkpoint in the mainly Shia Muslim area of Saddam City on Thursday evening, at least four US marines were injured in a suicide bomb attack. US marines told the BBC they saw an Iraqi man approach the checkpoint and detonate a number of grenades. In northern Baghdad, US Central Command said fighting raged for four hours around the Imam al-Adham mosque, before US marines crushed the Iraqi resistance. At one point the US military believed senior Iraqi leaders might be hiding there. One US marine was killed and up to 20 wounded when Iraqi troops - thought to be members of the elite Republican Guard - ambushed a marine convoy in the area with machine-guns and rocket-propelled grenades. "The world here has been turned upside down"